SAAB CONVERTIBLE TOP WON'T OPEN? SAAB 900 Tonneau (boot cover) motor failure? We no longer sell new gears for Saab Tonneau motors as many people were not capable of repairing the units properly. SAAB PART NUMBER 4859419 rebuilt and reinforced. The core charge will be refunded upon receipt of your rebuildable old unit. Core must have no cracks or other damage from attempted repairs, such as hinge pin bores drilled oversize or missing parts. ALL CORES ARE TO BE SHIPPED TO: 1455 SW 15th Terrace, Fort Lauderdale, FL 33312. ONLY! The core unit must be in original failed condition any modifications, broken castings etc. will result in no core refund. Core must be returned in 30 days or value will decrease by $50 per month. Core cannot be cracked or drilled or value will be reduced by at least $150. Your net cost will be $560.00 + shipping. 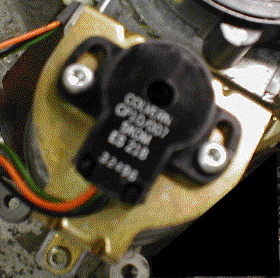 Be sure to remove the position sensor shown below and save it as it is not included. Many cores had these items damaged in shipping, a NEW one is over $200. Remove the two screws from the sensor, and remove the sensor by lifting it straight up. 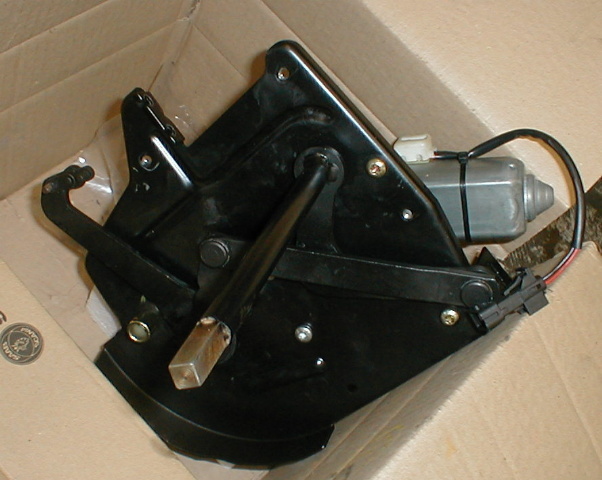 Next very carefully remove the black plastic drive coupling, that you can't buy without buying the potentiometer, Finally remove the single screw holding the bracket and lift from that end to release the tabs that are tucked into the motor housing. Save all parts for reassembly on your unit. 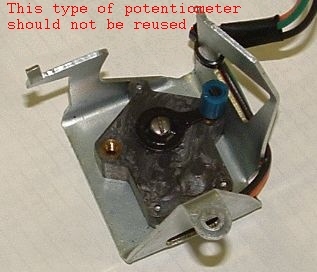 If your potentiometer looks like the one on the left, it is junk. Read the 1995 model bulletin by CLICKING HERE! Unit is warranted for 1 year from date of purchase. Warranty is subject to proof of programming after installation by a competent technician using the ISAT or Tech II. The following links are PDF docs. Fifth (5th) Bow Latch Motor Update. Have a 1995 model? CLICK HERE!